When talking about the famous 1925 Scopes (Monkey) Trial, the focus is usually on evolution and religion. But one of the important backdrops of it was the existence of social Darwinism and eugenics in the biology textbooks of the time. Not just that, but eugenics was also legal in many states in the US. 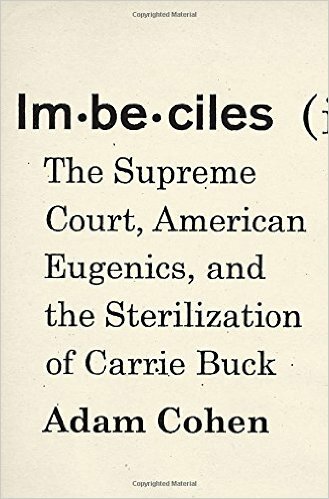 There is a fascinating new book out that talks about the a 1927 US Supreme Court case that - in an 8-1 decision - further strengthened eugenics in the US and led to at least 60,000 forced sterilizations. Furthermore, it served as a blueprint for the Nazi eugenics program. 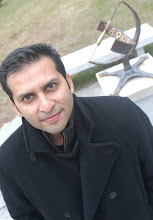 Author Adam Cohen tells Fresh Air's Terry Gross that Buck v. Bell was considered a victory for America's eugenics movement, an early 20th century school of thought that emphasized biological determinism and actively sought to "breed out" traits that were considered undesirable. as Darwin was describing it, and they believed 'We can help nature along, if we just plan who reproduces and who doesn't reproduce.' "
All told, as many as 70,000 Americans were forcibly sterilized during the 20th century. The victims of state-mandated sterilization included people like Buck who had been labeled "mentally deficient," as well as those who who were deaf, blind and diseased. Minorities, poor people and "promiscuous" women were often targeted. Cohen's new book about the Buck case, Imbeciles, takes its name from the terms eugenicists used to categorize the "feebleminded." In it, he revisits the Buck v. Bell ruling and explores the connection between the American eugenics movement and the rise of the Nazi party in Germany. Cohen notes that the instinct to "demonize" people who are different is still prevalent in the U.S. today, particularly in the debate over immigration. "I think these instincts to say that we need to stop these other people from 'polluting us,' from changing the nature of our country, they're very real," Cohen warns. "The idea that those who don't remember the past are condemned to repeat it — it's very troubling that we don't remember this past." This is this poor young woman, really nothing wrong with her physically or mentally, a victim of a terrible sexual assault, and there's a little hearing, she's declared feebleminded and she gets sent off to the colony for epileptics and feebleminded. (Photograph: Carrie Buck (left) and her monther (right) in 1924). He chooses her, and then under the Virginia law, they have to have a sterilization hearing at the colony, which they do and they give her a lawyer (who is really not a lawyer for her; it's really someone who had been the chairman of the board of the colony and was sympathetic to the colony's side) and they have a bit of a sham hearing where she is determined to be a suitable person for sterilization; they vote to sterilize her, and that is the order that then gets challenged by Carrie as the plaintiff first in the Virginia court system and then in the Supreme Court. When you add onto all that, the fact that in many, many cases the women involved were not told what was being done to them, they might be told that they were having an appendectomy, they weren't being told that the government has decided that you are unfit to reproduce and we're then going to have surgery on you, so that just compounds the horror of the situation. In 1927, a month after her sterilization, Buck was released from the asylum as hired help, on a kind of parole. Later, she married. Her sister Doris was also sterilized; interviews suggest that she thought the operation an appendectomy. Imbeciles traces their later life in detail, noting one of the most poignant aspects of the case — Buck's letters to the asylum about her relatives and probationary status. These, Cohen notes, revealed Buck to be intelligent and diligent in trying to contact and protect her mother and child, who lived with a foster family: a testament to one of the most spectacular miscarriages of justice in US history. To this day, the Supreme Court has never officially overruled Buck v. Bell. 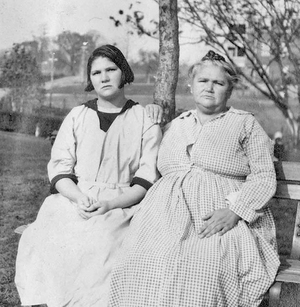 Also, see these amazing photographs of American Eugenics Society promoting "fitter families". Nice post about A fascinating new book about Supreme Court and Eugenics in the US.Thank you! !